The beautiful blue stone Larimar is a form of Pectolite discovered only in The Dominican Republic in the Caribbean. Its know range is limited to 1 square kilometre of remote, mountainous terrain, making Larimar a truly rare stone. Larimar came to be through the movement of hydrothermal fluid (super-heated steam rich in minerals) that was forced under high pressure from deep within the earth to the surface. As the steam travelled up through cracks, fissures, volcanic chimneys and lava tubes, it cooled and crystallized to form Larimar. Though pectolite can be found throughout the world, it is only in the Dominican Republic where the presence of cobalt causes the distinct blue colour. Quintessentially, Larimar is a deep sky blue, interlaced with a white webbing pattern that resembles light reflected in shallow water. Actually, Larimar’s colour ranges from pale sea green to intense blue with many shades in between. Some specimens are pearly white, others are laced with a red webbing. Generally, the deeper the blue colour of Larimar and the more webbing there is, the more highly it is valued, though this is a matter of personal taste. Although Larimar was known to the inhabitants of the region for generations, it was not until the 1970s that it was first noted and named, despite the efforts of a parish priest to secure permission from the Dominican Republic’s Ministry of Mining in 1916 to mine a blue rock he had discovered. The priest was sent back to Spain and Larimar remained undiscovered. In 1974 Miguel Mendez picked up some beautiful blue pebbles on the beach. Obviously intrigued and enchanted by the colour and patterning of the stone, which so much resembled the shallow seas of the Caribbean from which they were plucked, Miguel named his discovery after his daughter, Larissa, and the sea in Spanish, “mar,” hence the name “LARI-MAR.” It was soon understood that these pebbles on the beach were in fact alluvial sediments (minerals deposited by running river water) and an effort was made to trace the path of the pebbles back to their source; from the beach, up the Bahoruco River, to outcrops in the mountains. To this day mining by hand is the preferred method of searching for Larimar. Miners identify the ancient lava tubes and dig deep for their quarry. As it is only so recently discovered, there is not much history to the uses of Larimar. Its beauty has quickly earned it popularity as a gemstone of choice for jewellery making. Even contemporary Native American jewellery now incorporates Larimar into its designs. Larimar vibrates to the number 6 and the master number 55. Other names by which Larimar is known include “Dolphin Stone” and “Atlantis Stone.” It is believed by some that certain islands in the Atlantic Ocean, including the Dominican Republic, are remnants of the lost continent of Atlantis, and according to a prophesy originating in nearby Trinidad and Tobago, a blue coloured stone with healing properties would be found in the region. One could easily be forgiven for believing that Larimar is that stone. Essentially Larimar is a healing stone that promotes harmony and balance between one’s materialistic and spiritual realities. It does this by helping us to see ourselves from beyond our personal and limited perception of reality and to be our true selves in the material world. Integrity, objectivity and truthfulness are hallmark characteristics of the energy of Larimar. It helps us to see the bigger picture and put things into perspective. It helps us to look at out own selves objectively, which in turn makes us aware of our self-imposed limitations and allows us to work to be free of those limitations. Larimar is said to embody the elements of both air and water, symbolic of thought and emotion respectively. Consequently it plays a role in achieving balance between one’s emotional and mental states. It stimulates all of the chakras from the heart to the crown. Larimar is also attributed with attracting soul-mates to the user and customers to the salesperson. It cultivates a sense of calm and peace and may be beneficial for those who are under stress. It is said that Larimar has healing applications for ailments of the cartilage, hair and feet. Reflexologists may find it useful as it opens acupressure points in the feet. Spiritual healers have used it to purge entities. 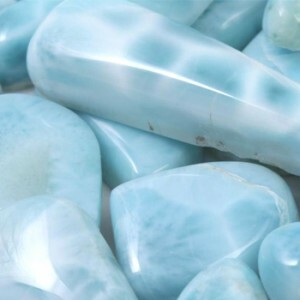 The benefit of self-realization that Larimar brings to the individual may be a precursor to something greater, as Larimar is considered an Earth healer. With the self-realization of individuals comes the self-realization of the planet.